The Nifty Lifty SP34 lift is a versatile and practical aerial man-lift. The large knobby tires are perfect for outdoor off-road use, and combined with its 4×4 capability, the unit is sure to make it through just about any terrain. 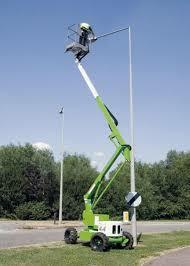 This lift is perfect for parking lot light changes, tree work and more!